May: There will be periodic delays of up to 10 minutes for clearing and excavation. 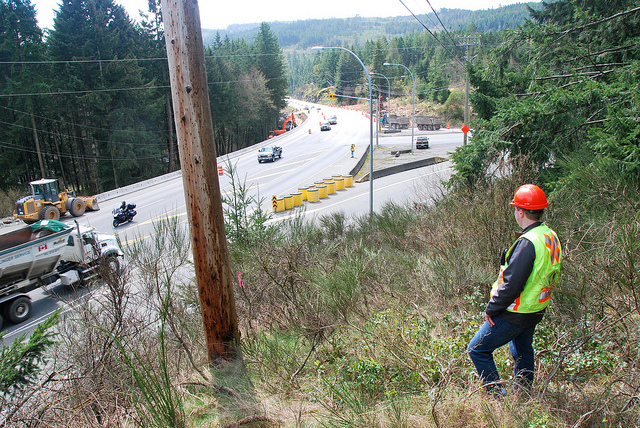 June: The Malahat Summit Rest area will be closed for the remainder of construction. June – September: We’ll be blasting rock, widening the highway and paving. There will be a construction zone speed limit of 60 km/h while this project is going on. Please drive safely, and watch for the Cone Zone! Southbound traffic will not be stopped between 6 a.m. and 9 a.m.
Northbound traffic will not be stopped between 3 p.m. and 6 p.m. Periodic delays of up to 20 minutes will be outside peak times between Monday and Friday. Starting June 15, traffic will not be stopped on Friday afternoons, Saturdays or Sundays. Traffic will not be stopped the day before, during and the day after long weekends. If you want to keep up with the latest as the project evolves, be sure to check DriveBC.ca and follow @DriveBC and @TranBC on Twitter. What a bunch of crap. If only the flagers and construction workers knew this I have now been stopped twice to let excavators cross the road at 7am. Why post we wont stop traffic southbound between 6am and 9am if you plan on stopping traffic. Thanks for connecting with us here. We will share your concern forward with the project manager. Limiting the delay to motorists is a priority to the ministry and we have committed to minimizing delays during peak hours. However, brief stoppages of a few seconds to allow construction equipment to cross the highway on occasion can occur at anytime, day or night. This, along with continuously changing roadside conditions, is why a construction speed limit of 60km/hr has been put in place 24/7. Motorists are reminded to watch for flaggers and obey the directions of traffic control devices and personnel. While very brief stoppages can occur at any time, we are still very committed to minimizing the delay for peak period travel and typically you should not be delayed by more than a minute or so in your morning or evening commute by construction activities. Construction activities that require more intrusive delays currently only occur outside peak travel times. Go MOTI GO, great job. Unless you are planning to widen the road from South Shawnigan Lake exit to the 4 lane road on the noth end of the Malahat the upgrades are a waste of money. Just because a few folk have called it Nazcar corner doesn’t mean it is. I’ve driven the road hundreds of times and have not seen any issues apart from the southbound 2 lanes choking when people reach the summit and it turns to one lane southbound. Spend your funding on a Mckenzie / Island Hwy overpass for good value and reduce greenhouse gases from idling.